The President died at 10.35. After the bulletin was issued, at half-past five this evening, the President continued in much the same condition as during the afternoon, the pulse varying from 102 to 106, with rather increased force and volume. After taking nourishment he fell into a quiet sleep. About thirty-five minutes before his death, and while asleep, his pulse rose to 120, and was somewhat more feeble. At ten minutes after ten o’clock he awoke, complaining of a severe pain over the region of the heart, and almost immediately became unconscious, and ceased to breathe at 10.35. 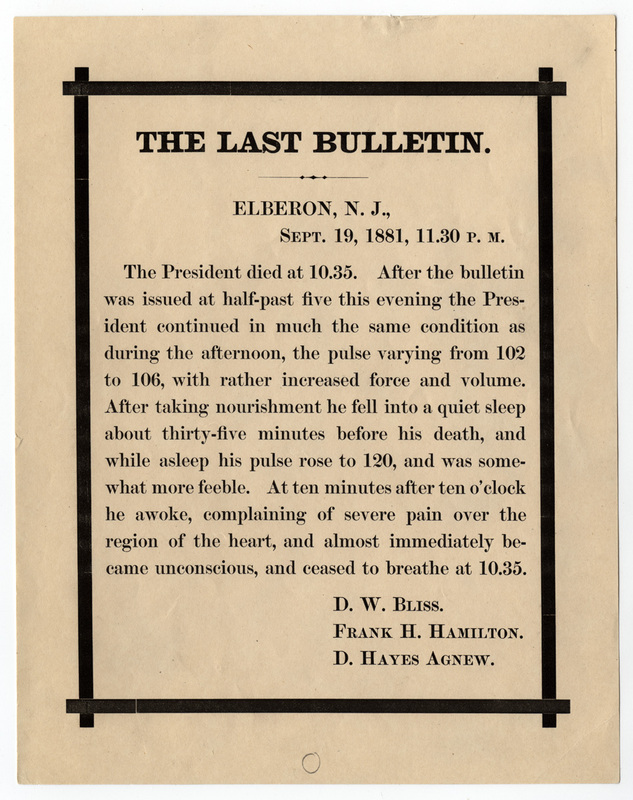 The printed version of the last bulletin, 11:30 P.M. September 19, 1881.